New trade agreements and a competitive Canadian dollar make it an ideal time to extend your company's reach through the export of goods and services. 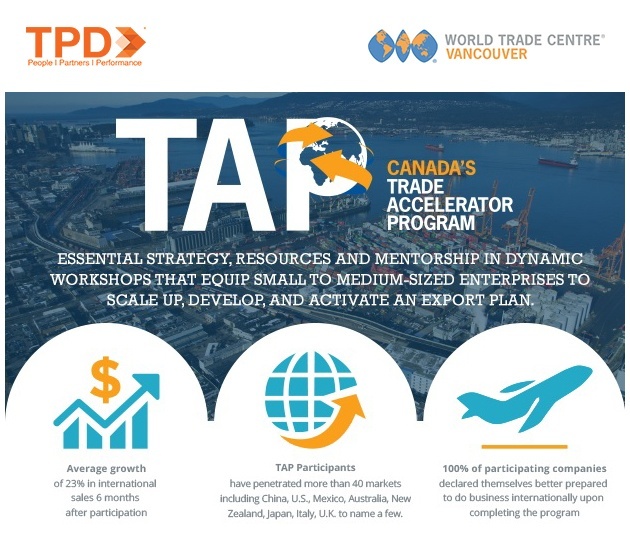 World Trade Centre Vancouver has successfully delivered Canada's Trade Accelerator Program (TAP), in B.C. since 2017. A growing number of SMEs have benefitted from the program in B.C. Listen to what graduates have to say about the program HERE. “TAP created the environment for us to think harder about decision making and strategic planning. It helped us figure out our priorities, made us focus. It has been a foundational building block for the next 3-5 years on how best to approach export markets”. Learn more about the program and apply today at tapbc.ca. Have questions? Call Rhonda McDowell on 604-640-5491 or email info@wtcvancouver.ca. Do you want to gain direct access to the senior-level audience at this event? As a sponsor, you will benefit from enhanced visibility, which can lead to new business and increased brand recognition. We offer a wide range of opportunities. To discuss how we can help boost your business, call Lisa at 604-640-5484 or email sponsorship@boardoftrade.com.